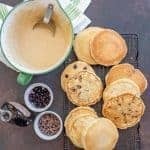 Tried and true simple homemade pancakes that are light and fluffy, easy to make and can be made traditional, whole wheat, or with blueberries or chocolate chips. Pancakes are one of those things that just don’t get old. I’ve been making a double batch of pancakes once a week (to eat half the day of and to keep the other half for later in the week) for my kids to eat for breakfast for years and years. Isn’t it amazing what you can turn just a few simple ingredients into? I have been making this recipe for years and though it was time to share it with you. It’s simple, tried and true, and lends to perfectly fluffy pancakes every time. 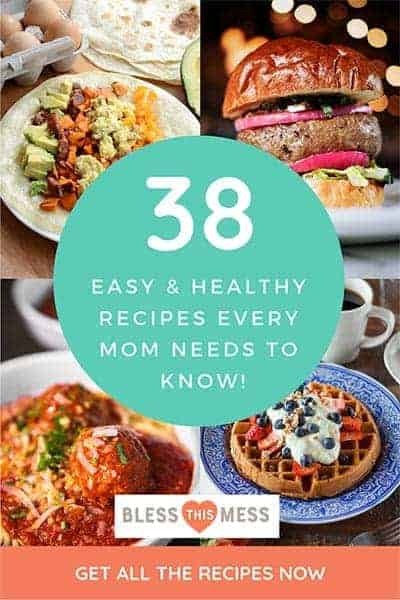 What I like about this recipe is that you can make it with whole wheat flour or all-purpose flour (or a combo of the two) and you can toss in blueberries or chocolate chips really easily. So you can get all kinds of pancake varieties out of one recipe. Often times I’ll make up a batch of the batter and just add the blueberries and chocolate chips to individual pancakes as I pour them into the hot skillet to cook. The kids can request what sounds good that day and it’s very little extra effort on my part. They feel like they are eating at a restaurant with someone taking their order requests but I certainly don’t feel like a short order cook because I only had to make one batter. How do you make fluffy American pancakes? 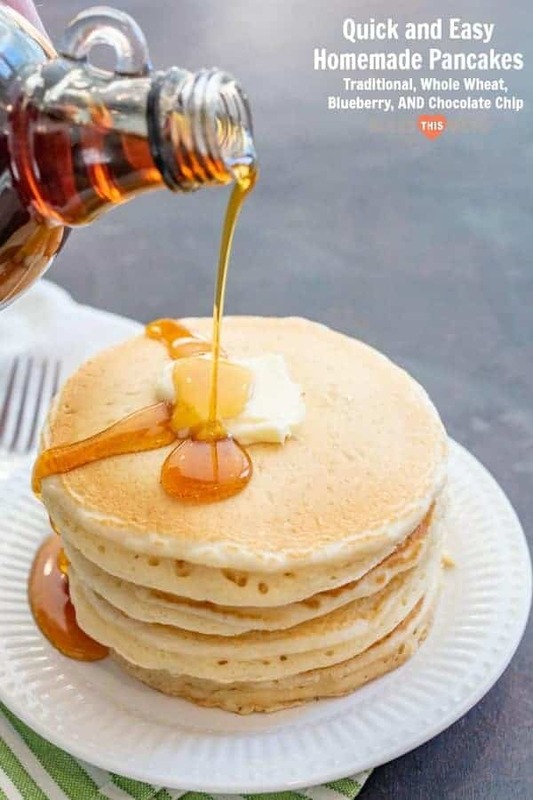 The secret to fluffy pancakes it getting your ratios of flour, leavening agent (in this case baking powder), and liquid just right and then stirring it long enough for everything to come together – but no so long that you develop too much gluten in the flour. When switching back and forth between all-purpose and whole wheat flour you’ll want about 1/4 cup extra milk to the whole wheat version so that your batter is thin enough to pour. I like to just drop a few chocolate chips or blueberries onto the pancake before flipping it the first time because not all of my kids like the same things (some like one kind, some like plain…). 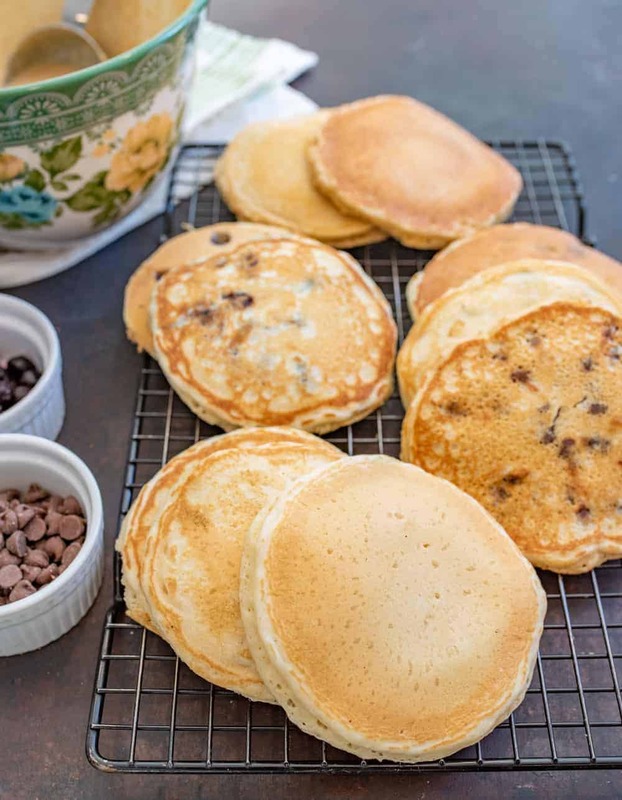 If you are making all of the same kind of pancakes feel free to stir your chocolate chips or blueberries in if you like, being sure to stir the batter before dipping out a new pancake so that they don’t all settle to the bottom of the bowl. You can use all-purpose, whole wheat flour, or a combo of the two. They all work great just be sure to adjust your milk as needed to get the desired texture and thickness of pancakes. 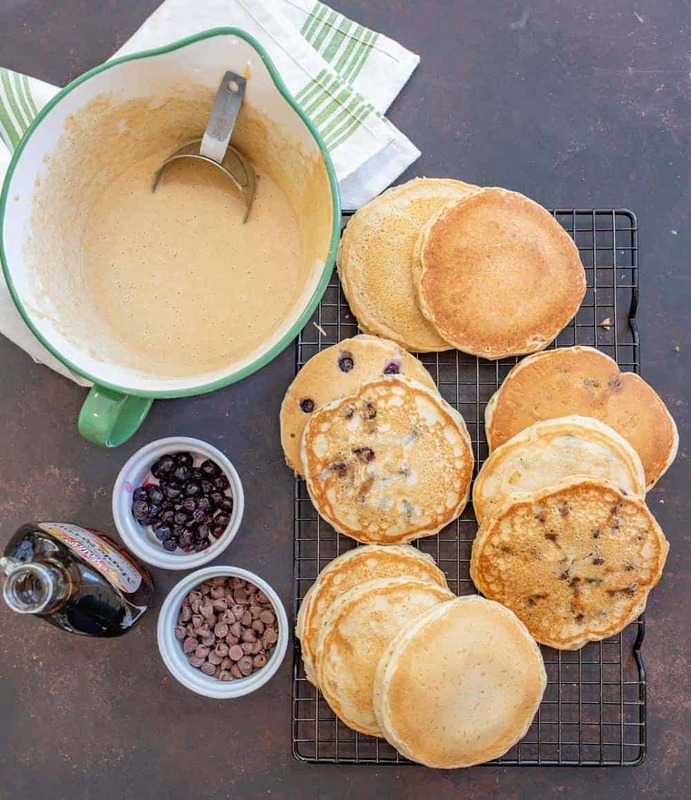 You can make your own pancake mix from this recipe! I do this often and it saves time on busy mornings. You can see all of the details on Pancakes from a Homemade Mix here. These pancakes freeze great! Just let them cook in a single layer on a baking rack. When they come to room temperature just place them in a freezer safe container or ziplock bag. They keep for up to 6 weeks in the freezer. Thaw over night in the fridge or pop a frozen pancake in your toaster! Add the flour, sugar, baking powder, and salt to a medium mixing bowl and whisk or stir to combine. Add the egg, milk, and melted butter or oil to the bowl and stir to combine well. the batter should be moderately thin and spread when placed on a hot griddle. You may need add a few tablespoons of milk to reach the desired consistency. Place the prepared batter on a well greased preheated skillet or griddle over medium heat. 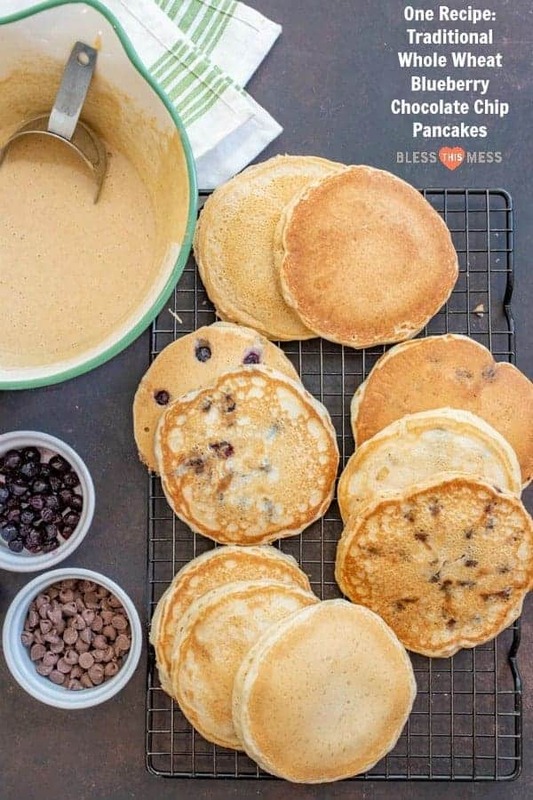 If you are adding blueberries (fresh or frozen both work) or chocolate chips, sprinkle a few on the top of the pancake before you flip it over. When the pancake bubbles and is light brown on the bottom, flip it over and continue cooking on the other side. 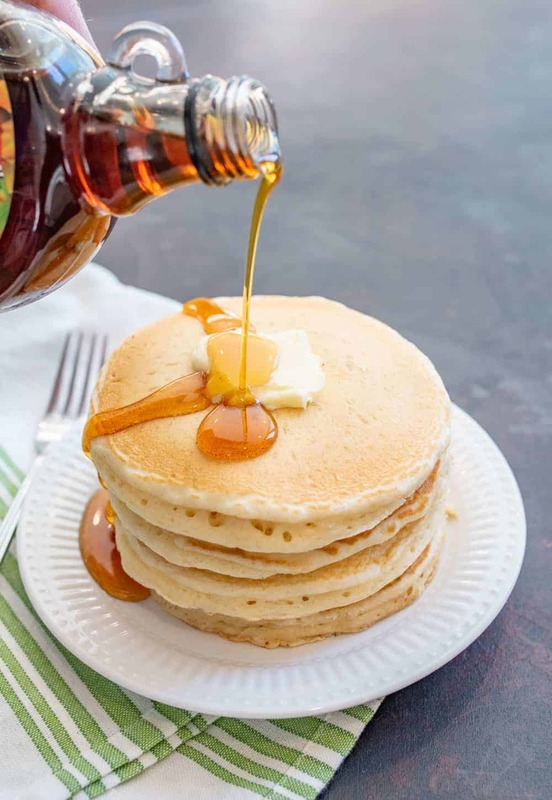 When the second side is cooked, removed from the skillet and serve right away with favorite toppings such as maple syrup. Simple food done well is always a good thing in my book. I hope you’ll love my tried and true pancake recipe as much as we do. And don’t forget, you can make this recipe into a homemade pancake mix which will make your mornings even easier. 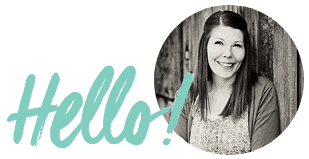 OK… help a girl out. I love blueberry pancakes, but they ALWAYS are raw around the blueberries. Same recipe, no blueberries is fine. Suggestions?! If you are using frozen berries zap them in the microwave a bit so that they are room temp or even warm and then pluck them out of your bowl with a fork so that you leave the extra juices behind. I also don’t stir them into the batter, I’ll just drop a few on the top after I pour it onto the griddle so that when you flip it, they cook more. Does that help at all? How the heck are you?! I miss you!